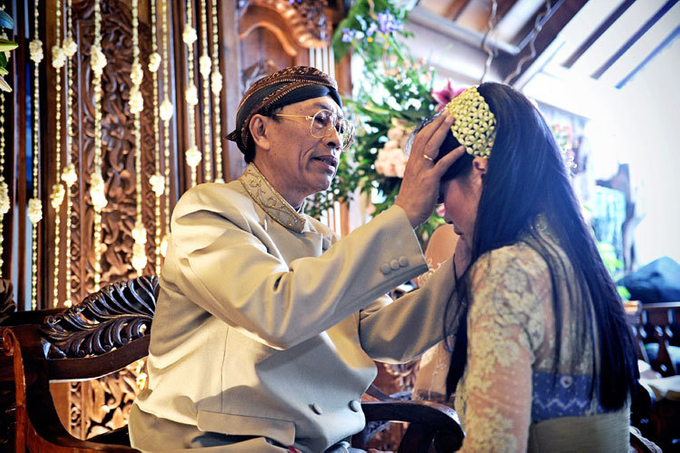 The siraman is one of the most common cultural rituals done in traditional Javanese weddings. The purpose is noble and sincere and the procession, sacred. For the sake of this ritual, today we uncover the delicate array of the Javanese siraman. From the name alone we can tell that siraman is closely related to water. Before everything, the water for siraman has to be prepared first. It has to come from 7 different sources and filled into a barrel which will then be mixed with various flowers. Then, the father puts on the Bleketepe (weaves of coconut leaves) that symbolizes family cooperation and hope for continuous family heritage. Sungkem, or asking for blessing is done next, followed by siraman from both parents and other respected relatives. To symbolize the burst of charm of the daughter as a mature woman, a clay jug is then broken. The bride is carried inside the house to convey parents' everlasting love until the very start of a new life phase. While waiting for the bride-to-be to change, little children distribute Kreweng (clay money) to guests that wish to trade it for cendol; this whole procession is called dodol dawet. Afterwards, is tanam rikmo or hair planting, followed by the release of black rooster that symbolizes sincerity of parents to let go of their children. At the end of the day, the bride-to-be will receive the Kreweng from earlier procession from her mother. This represents a mother's lessons about living independent and organizes a living in marriage life. To end this whole procession, parents of the bride to be will give last suapan and a loving kiss.